The Suited to Success team have been busy, assisting over 50 clients per week through our Boutique Styling program, just like Shane. Getting clients looking and feeling confident for interview can inspire self-belief and hope for a brighter future. Good luck Shane and we look forward to welcoming you back for a 2nd outfit when you secure a job. We are pleased to wrap up the 2017/2018 Accenture program in October this year. Accenture sponsored 166 unemployed clients to come through our programs. The lucky clients on the program included women returning to work, mature aged, people on visa pathways, underemployed, and LGBTI members. The dedicated team at Suited to Success spent the year supporting each and every client participant. The program enabled the participants to get help with dressing for an interview and one-on-one assistance with development of resumes and cover letters. Participants also had the opportunity to attend small group workshops to practice mock interviews. Workshops were held each month across the year and proved to be extremely popular with great engagement. Clients reported a 97% increase in confidence to present to an interview after the program. Accenture staff were involved in helping facilitation and delivery of the monthly workshops and in the weekly Career Hub sessions. Over the project 14 Accenture staff volunteered their valuable skills and knowledge to the clients and the project. Without valuable sponsorship Suited to Success would not be able to continue to assist unemployed men and women to build the skills and confidence for employability to thrive in work and in life. Want to be a Corporate Partner or Sponsor? Contact us now as we urgently need major sponsors for 2019. A big thankyou to George Sano from Imperator Menswear who kindly donated a total 110 items, which included amazing suits, pants, jackets and vests. In 2018 we’ve assisted over 1600 clients with around 45% of those clients desperately needing something to wear to an interview. This donation will assist our clients to make a great first impression at their interview. Thankyou Imperator Menswear from the team at Suited to Success. Thankyou to Debbie Hourston from CQ Universities for donating funds from the National Association of Graduates Career Advisor Service (NAGCAS) Conference in Brisbane over 28-30 November 2018. One of our Speakers Maree Pickett attended on behalf of Suited to Success to accept the donation and presentations to the conference speakers. This theme was developed to reflect the importance of technology in our future working lives, both for us and our students. Issues like artificial intelligence and digital disruption will have a profound impact on all of us. The reimagined workforce will be reshaped by an emphasis on entrepreneurship, casualization and robotics. Thankyou to the conference organisers, attendees and speakers for supporting the work of Suited to Success. In recognition of operating since 2008 the Hon Paul de Jersey and Mrs de Jersey hosted an afternoon reception at Government House on Wednesday 21st. Thankyou to the major financial sponsors, program partners, directors, staff, founding volunteers and success clients who attended the reception. With the support of those involved we have assisted over 8000 clients in Brisbane to overcome the barriers to employment. So far this year, we’ve completed over 951 styling sessions including two record breaking months in September and October and we are looking forward to conducting more to make such a difference to the lives of those who are facing barriers to employment. There are many ways you can get involved and make a difference. 3. Invite us to visit you with our range of brand new designer wear items donated this year with original item price tags showing between $150 and $300 which we are selling for $50. 4. Make Suited to Success your charity of the year and send us a donation – every little bit helps. Thankyou to the Hon Paul de Jersey for supporting our work within the community and to those who continue to contribute. If you didn’t make it to our annual fashion event Bubbles & Beauties 2018 at City Hall you missed a great evening of fashion parades and designer pre-loved clothing and accessories. At this years event we launched our new Tote Bags for sale. They are a great way to ensure we care for the environment by recycling. Visit our Tote Bag page on our web site to see all the history and how we are recycling. two bags will provide a client a Confidence Booster, mock interviews and resume consultation. Please purchase your Limited Edition Tote Bag Now to help a client. This Brisbane criminal lawyer is giving away 82 of his finest suites to help men looking for work. Daniel was kind enough to promote the work we do in our styling sessions where we give clients interview outfits. We will be lucky enough to receive some of the suits that we can dress our clients with. Thankyou Daniel for your support of our work and kind offer. Raising awareness of our work in the community is vital to continue our services. We are pleased to announce the major project funded by the QCF Foundation has been successfully completed with the Foundation planning a site visit in late November to view the outcomes. The Foundation sponsored a major infrastructure project “Meeting Future Needs” which enabled Suited to Success to build a customer relationship management system. After much hard work we’ve been operating the system since the beginning of the year with the build taking place over several months and implementation over 9 months. Thankyou to Beyond CRM for building and assisting us in the design and implementation and review phases. This system has greatly impacted our ability to track and maintain client data which assists not only our volunteers and staff but also allows us to work more efficiently, leaving more time to spend assisting unemployed clients. If you would like to sponsor a major project to assist our work in the community like the QCF Foundation please contact us. Another year, Another Bubbles & Beauties over! What a fantastic event we had this year! A huge thankyou to everyone who came along on the night, enjoyed some bubbles and made some amazing designer purchases. Overall the event was a complete success, Raising much needed funds that are vital for us to keep our doors open so we can continue operating and offering our services to clients. And all of our Suited to Success staff and volunteers for helping out on the day. We'll see you all again next year! Brisbane charity Suited to Success which helps people one outfit at a time to overcome barriers to employment has received a grant for $10,000 from the Brisbane Women’s Club (BWC) charitable Grants Program. The not for profit community organisation started as a group of fashion-conscious ladies getting together to provide clothing to women needing smart outfits for job interviews has become a successful social enterprise assisting more than 7000 people. 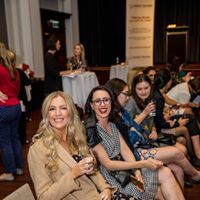 The $10,000 grant from BWC means Suited to Success can assist even more women in getting job ready and will contribute to the charity’s association with the Australian Catholic University (ACU) to extend, review and further develop a youth program to specifically identify and address women’s issues related to employment. Suited to Success General Manager, Nicole Hard said the grant will allow them to select 10 clients facing barriers to employment and work with them to provide a styling session, assistance with their resume and interview skills, and most importantly help develop a personal and professional plan which will support them on their often difficult journey to gaining employment. In 2017 two Grants Program recipients were awarded $5,000 – Queensland’s oldest charity, Lady Musgrave Trust, and Logan Women’s Health & Wellbeing Centre. Watch out for updates on the journey of these lucky clients who will participate in this program. As a community organisation Suited to Success assists men and women overcome the barriers to employment. The Australian Government is undertaking a review into what a future employment services system might look like. This is part of the Government’s ongoing focus of getting Australians into jobs. The Department of Jobs and Small Business held face‑to-face consultations with key stakeholders to help inform the design of a future employment services system. The roundtable coincides with the release of a public discussion paper that sets out key issues to be considered in the design of a future employment services model. The discussion paper has been informed by the work of the Employment Services Expert Advisory Panel (Panel), which is independently chaired by Mrs Sandra McPhee AM. The Panel contains representatives of employers, welfare groups and employment service providers. It also contains a labour market economist and an expert in business transformation. The Panel has considered national and international evidence and tested some of its preliminary thinking with users. 2018 is set for some wonderful opportunities for us to reach even more clients. It's really important that organisations like Suited to Success exist so that people can come in and get the help they need to get them on the right track to securing lasting employment. We are looking for financial and strategic partners to get involved and be a part of our journey to assisting more clients. Please contact us to find out more and be a part of our journey in 2018. A huge thank you to the ladies auxiliary for welcoming us to the Easter High Tea and getting involved to support our clients by donating $500 and collecting 471 clothing items for our boutique. The high tea was attended by 250 members of the ladies auxiliary, and hosted by the Principal and Deputy Principal of Nudgee College. Employment Relationship Advisors, Livingstones hosted Nicole Hard, General Manager and Dianne Gillis, Director at a cocktail function at Blackbird Bar and Grill to celebrate gender parity for International Women's Day. The Brisbane office are getting together to collect work clothing for our clients and planning to further support our clients and programs in 2018. The community team from Waterfront Place are getting together to raise awareness for International Women's Day with a collection of clothes and money from a morning tea. It's vital for our continued operation to get members of the community involved, so a big thank you to Jessica Kiely and the team for hosting this event for us. Compass Group have got the staff in the office to get together to support International Women's Day and Suited to Success to #pressforprogress for gender parity. Thank you to the team for supporting our clients. In 2017 we assisted over 1400 clients with 70% of our youth program graduates obtaining a job after completing the program, while 97% indicate an improvement in their self-esteem. We are helping our clients one outfit at a time. 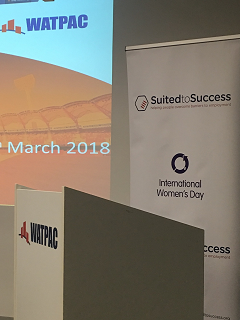 Watpac supported Suited to Success at an International Women's Day event. It was a pleasure to speak to over 100 men this morning and see how Watpac supports gender parity in their workplace, they are really 'doing the doing' and pressing for progress by collecting clothing and raising much needed funds. It was great to see so many men in the workplace supporting IWD and our women's program. Donations from Watpac will really help the over 1500 clients we receive each year back into work and on the path to independence. If you want to support Suited to Success and get involved reach out to us today ! Komatsu Mining Corp. at Murrarie have jumped on board to raise awareness of Suited to Success with the Brisbane team running a clothing drive and holding a morning tea for International Women's Day. Komatsu operate with a genuine social responsibility to initiate, invest and maximize positive impacts in their people and communities globally. We have been fortunate enough to source a new graphic designer to assist us with our designs. Celeste Fishburn from design by fish. A creative allrounder is passionate about helping those less fortunate in the community and are thrilled to have her 21 years of expertise contributing to our success. Q-Super are supporting Suited to Success in 2018. At an open day in January 2018 we had the opportunity to roll out Workplace Giving to their employees. Q-Super are also supporting us with superannuation and budgeting resources for our clients. Want to get involved like Q-Super? Contact us.